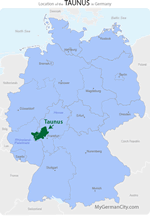 There’s no more appropriate way to introduce the subject of the Taunus region than with the Latin version of what you are likely to tell your friends when you return home from visiting them! The Taunus Mountain Range, surrounded by the Rivers Main, Lahn, and Rhine, is at the heart of Germany’s Roman Limes district (hence the German Limes Road that runs right through it). The Roman Limes curved through the wooded heights of the Taunus, enveloping the fertile plains of the Wetterau beyond. The Taunus Mountains remained a Roman stronghold until 260 A.D., and many of their forts and watchtowers have been fairly well preserved. The most significant of them, and one you shouldn’t miss, is the fully-reconstructed Saalburg castellum not far from Bad Homburg. You aren’t likely to come any closer to an experience of 3rd-century life on the frontiers of the Roman Empire than you will by visiting the Saalburg museum. Its rooms, which once held Imperial offices and weapons stores, are grouped around a typical Roman courtyard. Tour the infantry barracks, the tiny dimensions of which were home to eight soldiers. At the right time of year, you’ll smell fresh Roman bread baking in the fort’s restored ovens. At any time of year, see how the off-duty soldiers relaxed at the Taberna, a café replica of a Roman tavern. In front of the Taunus Mountains lie some of Germany’s oldest spas. One of the most spectacular is in Bad Homburg, which was the playground of royalty from around the globe. On the southern slopes of the Taunus, not far from Frankfurt am Main, is Königstein im Taunus. Although the first documentation of Königstein dates to 1215, Franconian legend attributes its origins to King Chlodwig, who died in 511 A.D. The ruins of the Königstein Castle sit on a hill to the northeast of the town, just below the ruins of the Falkenstein Castle. Climbing to to them will reward you with a dramatic view of Königstein and the Frankfurt countryside beyond. Wiesbaden, with its hot springs and Kurhaus casino, was a 19th-century magnet for the European aristocracy. Both Richard Wagner and Johannes Brahms were regular visitors. Dostoevsky drew inspiration from the surrounding hills. Today the capital of Hesse maintains an elegant air. Its rococo Staatstheater regularly presents operas, ballets, and dramas. Across from the State Theater is the World’s Biggest Cuckoo Clock, one of several you will find in Germany. This one is crowned with an enormous beer’s head! Atop a hill at the northern end of Wiesbaden is the Neroburg Tower, all that remains of the Neroburg Hotel. Climbing to it will let you relax in the Tower café and enjoy the outlook from the hill’s 833 foot/254m summit. Just northwest of Wiesbaden is the Taunus Wunderland Amusement Park. Its five acres have a surprising variety of carousels, roller coasters, slides, and water rides. The larger of its two roller coasters covers over 1200 feet/360m of twists, turns, climbs, and dips. The Silver Arrow slide is actually three covered slides in one, with a 40-foot/12m center slide which is Hesse’s highest. Kids tired of riding will enjoy the petting zoo, the giant trampoline, and the haunted house! Regardless of your interests, the Taunus has the vacation opportunities to satisfy them!